When Is An Embossing Folder Not An Embossing Folder? If you have been reading my blog for any time now you know that I like to craft the most frugal way possible. Which means giving my tools a real workout and sometimes finding other ways to use them. You also know that I like to experiment and see what frugal ways I can come up with to do things. Finding another use for my embossing folders was no exception. Answer to question when the embossing folder is used as a printing plate. The paper on the left is the raised side of the folder inked. The right side of the folder is the recessed. I really like the right side. This was done with copy paper and Tim Holtz Distress ink. You will get different looks depending on the type of ink and paper or card stock which is used. This was done with copy paper and my pearl pigment ink which is not as juicy. And this last picture is for those of you on the Silhouette Plus forum who were wondering if you could emboss using a folder without a machine. Yes Virginia you can. At least with copy paper if it is damp. I wanted to see what happened if I misted water on the folder after inking it. While doing it I got the paper which was on the other side of the folder wet. So I played more and the copy paper does have to be wet for this to work. I rolled a brayer over the folder with the paper or card stock in the folder both for stamping and the final one where it actually did emboss. There you have my experimenting for the day. I hope that you find this helpful if you have a bunch of embossing folders gathering dust. Or if you should be lucky and find some at a garage sale or thrift store. Of course if you find some on sale you like by all means pick them up. ;) Not that I'm enabling you to spend money. LOL! Have a Frugal Crafting time until we meet again. I love the Mastercard commercials with the phrase "Priceless". There are just some things that money can't buy. Then there are things that money can buy which are still priceless. For me "Designer Edition" of Studio is one. Some people say it is a waste of money especially when you can do some of the things like really erase or convert SVG files to be used in a free program. However, that free program means more software for me to learn. I like quick and easy. This is my personal preference so if something else works for you go for it. I've had in mind for several months making a card with a shoe on it. I even bought a book with drawings of shoes and quotes about shoes. Then I checked out at my library the book "Homemade". Sorry don't remember the author's name or the full title. It is a long one. It is full of crafting projects,techniques,and some templates to copy. On the front cover is a card with a shoe. I loved the look of it and knew that I wanted to do something similar. I also wanted to do something a little easier. The instructions had you make a shoe template to use as a stencil. Put the stencil on the front of your card stock. Spray adhesive and sprinkle glitter and then cut out the top part of the glittered shoe by hand. There was both this shoe template and a sandal with straps. I will be doing the sandal in a later project. This is what I have so far. Using Designer Edition I erased for the card base the parts of the shoe I did want cut out. The shoe is white because I didn't cut another one out after seeing that the card base was going to work. I am going to heat emboss the shoe so the color doesn't matter. The original card had the words priceless and $ signs on the tag. I wish now I would have heat embossed the under layer on the tag to have embossed letters. Although they had the striped paper for the inside of the card you could glue it behind the shoe on the base so that it is facing out. Personally I like the shoe shape but it does make it a little more challenging to put a sentiment on the inside. I am going to stamp a sentiment on a tag the same size as the one on front and glue it on the backside. I like how I can start a post and it will be saved so I can add to it. Here is my finished card. All except for the inside which will take me only a few minutes to actually do but longer to decide what sentiment to use. LOL! Yes, Cameron jumped into the picture again but then he did almost all the work. I love how he can cut words or letters out on an element. As well as cut out almost any shape I throw his way. My selection of embossing powder is limited but I think the Purple Pearl for the shoe works. Besides purple used to be for royalty only and my sister may be not be royal by birth but she is royal by spirit. The foil card stock was a scrap that was the perfect size. I love this card stock from my Black Currant card stock pad so use every bit of it. I love how this card turned out and am glad I challenged myself to figure out how to make a cutting file for it. Now I can't wait to make a card with the sandal template. Thank you for stopping by. I hope I have inspired you to take a shape and cut part of it out on a card base. Then piecing a duplicate on the card. I am thinking this could work with a dress. LOL! My mind is beginning to percolate possibilities. I don't know what my next project will be but do come back. Happy Frugal Crafting till we meet again. For those who don't know Moxie Fab World has a Trigger Tuesday Inspiration. Cath posts an image along with details for entering the challenge. This is the image for the inspiration and you have until the 29th of April if you are interested in joining the challenge. I will post the link at the bottom of this post. LOL! I don't want you running away before you see my creation. This dress is totally fabulous. I wouldn't mind opening my closet to see it hanging in there. It would bring a smile to my face. I love the butterflies and love to use butterflies in my projects. The color combination is totally fabulous. I wish I could have duplicated it exactly but I tried to come close with what I had on hand. Which happened to be a couple of paint sample cards. I also love the detail of the lacing. Of course this gave me an excuse to do a lacing piece for on the card I made. Oh you wanted to see the card instead of reading a novel because I'm rambling on. Drum roll please! After I snapped the picture I realized that Cameron had popped into the frame just as I snapped the picture. Guess he wanted credit for cutting the white card stock which I laced the ribbon through. 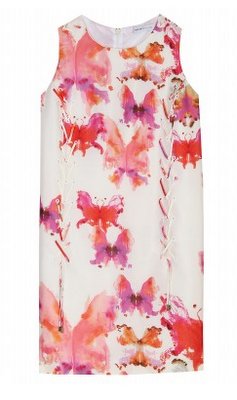 The butterfly is one I stamped in the previous post. At the time I didn't know what I was going to do with it. I added buttons to pick up the pale pink in the dress. As I already said Cameron cut the card stock which I chalked orange to pick up the orange in the dress. Then laced purple ribbon through it. My ribbon was the perfect width. I placed the ribbon strip horizontally to cover the seam where the two piece of paint chips meet. The background is orchid blush and watermelon smoothie paint samples by Glidden. (LOL! I may just have to pick up these colors to paint my old dresser.) I painted watered down white pearl acrylic paint on the paint samples. It turned out to be more silver than white. I wasn't sure I liked this card when I got it done but it has been growing on me. Let me know what you think. If you want to join the challenge you can find the link here: http://www.moxiefabworld.com/2012/04/tueday-trigger-watercolor-butterflies.html Even if you don't wish to join the challenge I encourage you to find an image and see what you can come up with using it as your starting point. My frugal tip of the day is to gather paint samples when you see them. LOL! They are a cheap alternative to colored card stock. Many of them also come in fairly large size now. I actually had to trim these to fit a standard size card. I'm off to work on a card I saw in a book. Thank goodness I opened in Studio the template I scanned in before returning the book to the library because I ended up taking a picture of it. LOL! Cameron will be happy as he will be doing the majority of the work. Fingers crossed it all works out so I can post it next time. Thank you for stopping by. Do come back. Happy frugal crafting till we meet again! Every time I go to a local dollar store I look in the craft aisle. For a couple of years now I've looked at their wood shapes but they have always had shapes I have no use for. Just before Easter to my surprise they had both wooden flowers and butterflies. They come in packages of ten so I can experiment. LOL! I hope the store has more next time I go back. For my first shape I've taken a flower one and brushed on a mixture of Gesso tinted with ink. I want to stamp on it. after it dries. I could have also painted on it and then stamped after the paint dried. The great thing about this is if you goof stamping you can brush more Gesso on it or paint over your mistake. The Gesso dries quicker so that is why I like to use it. The wild plum ink Gesso has dried brighter than I thought it would. LOL! I thought it would be too pale when I was mixing it so added more ink. Pigment inks work best and can be heat set with an embossing gun. As you can see I used StazOn here. I would have gotten more even coverage if I would have used my brayer for inking the stamp. Still I'm pleased with the way it turned out. Make sure it dries thoroughly so you don't smudge the ink. Especially if you decide to color your stamped image using markers. I haven't decided whether to heat emboss clear embossing enamel over the flower or not. If I was going to make a key chain or pendant out of this I would Gesso on both sides and heat emboss after stamping. Just to protect it more. The butterfly shape here I stamped directly with the pad onto the butterfly. I love the mottled effect I got. You can get really creative with lighter and darker areas. Making rectangles or squares with the ink pad. etc. The most challenging was inking the edges of the butterfly. Using my brayer inked the stamp and stamped. Because I was stamping directly on the wood which had not been sealed I went ahead and tried a rainbow dye pad. I figured if I didn't like it or the ink smudged I could always paint over. I like the softness and the subtle differences of colors. My last shape I rubbed olive oil over the shape to seal it. I let it sit a few hours to make sure it was dry. I did not have any tung oil as it has been a couple of decades since I've restored woodwork or furniture. Or for that matter finished unfinished wooden things. Anyway I think olive oil is less toxic and definitely less expensive as I already have it in my kitchen for cooking. I love how the Copper ink came out even though I lost the metallic sheen. 1. Stamping over a Gesso or paint covered surface. 2. Stamping over a ink covered surface. 3. Stamping on bare wood which has been sealed first with something like olive oil or tung oil. I hope I have given you some ideas of how to decorate wood shapes. By the way you can seal the shapes and stamp with them. LOL! If I don't get too distracted I plan to do a future post on that topic. Remember using wood shapes is an inexpensive way to add to your projects. something which is a little different. There are so many ways you can use them but here again that is a future post. LOL! Thank you for stopping by. Do come back as I'm working on a card for the Moxie Fab World Tuesday Trigger using one of the stamped butterflies. Hi everyone! I took a week off from crafting but am back now. I needed to take a break as I was getting frustrated with my lack of organization of my supplies. Alas I still have not found many of my supplies. So for this card I substituted my pastel chalks to color the basket of tulips instead of my colored pencils. Just felt like I needed to go ahead and do a project. Back in January over at the Silhouette Plus forum there was a challenge to create a design in Studio with a letter. I had fun with that challenge and thought it would be neat to have a challenge where people created a card using what they designed. So until the end of the month you can join in the fun at the Silhouette Plus forum. If you don't have Studio software or even a cutter you can still do some of the things I did with this card. More about that further down. Without further ado here is my card. Fresh off the crafting table today. Sorry but my camera did not pick up all the sparkle of the cut tulips. My mat was made using an upper case B with the Lucida Calligraphy font. I just duplicated,rotated,and welded to come up with my mat. I originally was going to cut out my design but after four tries and the card stock either tearing or not cutting out in places I gave up. I think it is time for a new mat and blade. Since this is also happening with intricate purchased files. I was surprised at what a difference adding a pattern can give to a design. Compare the design with a pattern and with just the background filled with color and the cut lines made thicker and color changed. My abstract sun was created using the first part of Debbie's video on creating doilies over at Paper Pulse. LOL! This would also work as a seal on a document or even a flower. I heat embossed it with my Zing gold embossing powder. The basket of tulips is a free digital stamp. I believe it is by Bird but not sure. I traced it for a Print and Cut in Studio. I went ahead and deleted the places I did not want to have cut out after releasing the compound path. I also went ahead and edited some of the nodes so that when cut out they would look better. I made a duplicate and set it to just cut edges. The basket with the cut out was colored with my pastel chalks using Fantastix coloring tools. By the way these are worth the investment if you play with different mediums. The solid basket was heat embossed with once again my Zing embossing powder. LOL! If you duplicate something like this make sure you heat emboss on the correct side. Luckily I caught myself before embossing on the wrong side. Once the two baskets were glued together so they became one I pop dotted them on the front of my card. So there you have my card and yes you can do something similar to this. Believe me if I can do it anyone can. If you don't have Studio software or something similar you can still make your own backgrounds with a graphic program like Photoshop or the free program Paint.Net. It may be more work but trust me it can be done because I made a lot of my own backgrounds for my web site and my own crafting. Like any software there is a learning curve but just by playing and following tutorial I have been amazed at what I have created. If you don't have a cutting machine that allows you to cut out images you can cut out by hand images. I have done this for decades. Do have on hand a good craft knife with a sharp blade and manicure scissors. As well as lots of patience. I hope I have inspired you to perhaps try something new or even to dip your toes in the Design pool if you haven't yet. Over at Moxie Fab World until midnight EDT on the 9th there is a challenge to use something non paper that you would probably throw out. Well I had these scraps of ribbon trimmed lace and I'm thinking they are so short I'll just toss them. Plus they are stained on the ends. (They were in a bag of assorted lace and ribbon I bought at a thrift shop.) So unless I was going to glue them under they would be even shorter. Then my mind got to working on how I could use these scraps of lace. I also wanted a way to give someone a necklace in an unusual way. Here is my card. I found the Avon pendant at a bead shop for $1 and knew I wanted to turn it into a necklace for someone special. I have been looking for months now for the perfect chain and found this chain with beads. I love how they go with the pendant. I cut a square out of card stock and ironed a piece of scrap heat bond on it. Then I took the backing off the heat bond and ironed my lace pieces on top after I had placed them where I wanted them. Glued the edges where the lace was stained underneath the panel. You could also do this with pieces of ribbon,scraps of fabric,or even yarn. I took the scalloped label in the Studio library and made it the size I wanted. Then I snipped on both ends of the top so that the chain would have a place to hang. I heat embossed the scallop panel with glitter gold embossing powder. I did some thinking and decided to cut a square and glued it on three sides as a pocket on the back of the scallop piece to hold the chain so that it would not hang below the card. I then attached my lace piece onto the front of the scallop piece. I decided to attach velcro buttons to the back of the panel. I found the easiest way is to have both pieces velcroed together when I go to attach to the panel and then card. I figured by having the panel velcroed it would be easier for the person getting the card to store the necklace back on the card if they wished. Since they could take the panel off and put the necklace on it and then velcro the panel back on the card. There you have it a couple of pieces of lace saved from the garbage and I think a very unique card. As well as an inexpensive card to make since the square and scallop were cut from scrap card stock left over from a print and cut. The necklace cost me a total of $3 to make with left over bead chain for other projects. Here is the Moxie Fab World link. Even if you don't have time to submit something check out what others have done for inspiration. There are lots of really fabulous entries for this challenge. Thank you for stopping by. Do come back as you never know what I might have up my sleeve next. 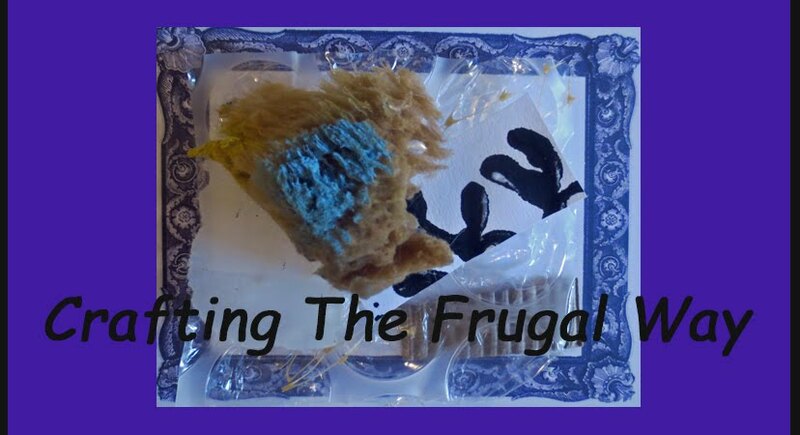 If you have been following my blog or belong to the Silhouette Plus Forum you know that I am a frugal crafter. I hate to spend money on things I can make myself unless it is something which is on sale and a darn good price. So when I heard that Moxie Fab World had a DIY Embellishment challenge I knew that was for me. Except for the rhinestones everything is cut out of card stock using my Cameo. The background was a free file. I don't know if Scalloped border came with my Cameo or whether it was a free shape. I cut it out and heat embossed it. I like the delicate metal look. The flower is just called flower in the Studio library. I un-grouped and got rid of the circle which was in the middle. I heat embossed with my own concoction of Kaleidoscope,Eggplant Pearl and Purple. The picture doesn't really do the color justice. I shaped the petals by hand. The center is a file simply called embellishment. I heat embossed it and added the rhinestones. I thought of coloring the rhinestones but decided to leave them clear. The flower is pop dotted on. I definitely will be using the embellishment file more. I'm thinking that it could be glued on brads for an embellishment. I like the fact that I can make it whatever size I want. I'm not limited to what size it might come in at a store. Also I can make it whatever color I want. Don't be surprised if you see more heat embossed cut out mats in the future. I really love that look. Thank you for stopping by. I hope I have inspired you to make your own embellishments whether with a cutting machine,dies,or punches. Right now over at Moxie Fab there is a paper scrap challenge using scrap paper in a project. I thought it was time for me to do this challenge. 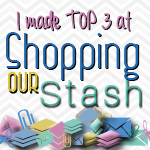 Especially since my scrap pieces of card stock and papers are beginning to take over every available surface and drawers in my crafting area. Not only that but I have all of these old bills and other mail which needs shredded and so I started salvaging some of the envelopes to use in crafting. The envelopes are lined with interesting paper which could be inked,chalked,stamped on,etc. or left just as is. If you are going to cut this paper with a Silhouette cutter you will want to use print paper medium for the cutting setting. Here is the note card I came up with. I cut into a rectangle a scrap of card stock left over from cutting out shapes. I decided to use the negative from the butterfly I cut out for the card in the previous post.The narrow edge left from cutting out shapes I used my border punch on to make a narrow piece to fill in at the top. I cut a left over shape which was the inside of a frame so it looks like a partial sun as the oval was too large. I had attempted to do a resist emboss on the front of a card but did not like how the inks worked on it so cut a couple of rectangles from it to use on this card. The unused other side of the card is the base. Did I mention that I'm a frugal crafter. LOL! Since the pink was plain I embossed it with a border embossing folder. The left over shape I heat embossed and then inked as it was too stark as white. If you decide to do this you will want to leave spaces in between your pieces because you will be doing heat embossing. That is the reason for either using adhesive spray or running the base through an adhesive machine. Depending on the embossing powder you use the base may not show. This would be a great way to use for a base perhaps a color you are not all that fond of. Keep in mind if you are using cut outs they will be heat embossed. I wish I would have had silver embossing powder but only had gold or Bronze embossing enamel which will also work for this. I figured the eggplant pearl embossing powder would have been too much purple. The butterflies were cut out of envelopes. Then ink rubbed on and glitter applied. Scrap Floss was used for the antenna for the negative butterfly and the cutout ones. Thank you for stopping by and do come again. You never know what creative thing may be next. Have fun crafting!